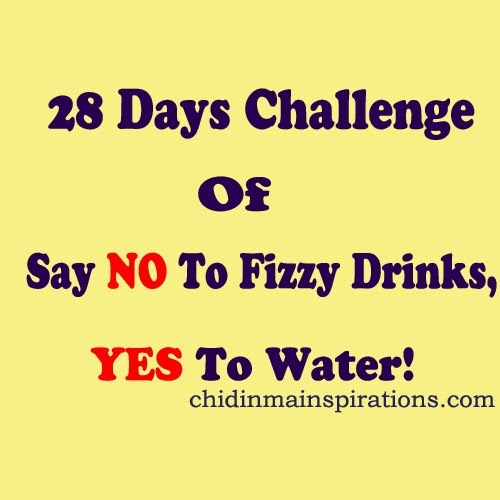 Chidinma Inspirations: Day 23 Of The 28 Days Challenge Of Say NO To Fizzy Drinks, YES To Water! Day 23 Of The 28 Days Challenge Of Say NO To Fizzy Drinks, YES To Water! How was your day and how was your day's challenge? Was it a success? Were there improvements? Hope you there improvements as regards your water intake today? Please do share with us how your Day 23 went. My day went well. I bless God. My today's challenge wasn't a success. I am still a bit strong but I am getting better. I was craving malt which I took. I also took green tea. I won't say I drank lots of water today considering the fact that I love water so much. Looking forward to ending this challenge with success and great health. So beautiful people, how did your Day 23 go? P.S- If you are yet to join us in this challenge, please do feel free to do so. You are more than welcome to join us. Please do invite your friends to join us in this challenge so that we can inspire one another.